Today, scientists at 22 synchrotron light sources are analyzing protein structures, and the worldwide Protein Data Bank contains the structures of more than 72,000 proteins. On June 17, 1975, four young scientists struggled to mount samples and align an instrument in one of several small hutches grafted onto an 80-meter accelerator ring at what is now SLAC National Accelerator Laboratory. The hutches were part of a cutting-edge initiative called the Stanford Synchrotron Radiation Project; and the experiment they performed that day would demonstrate a powerful new tool for determining the structures of proteins. The basic method, then and now, was to turn many copies of a protein into a small crystal and hit it with X-rays, which scatter and form a diffraction pattern. Scientists interpret the pattern to determine the proteins molecular structure. However, previous X-ray sources had been too weak to study the smallest crystals and most complex proteins. Now the scientists at SLAC would try a much more intense source: X-rays emitted by electrons speeding around the SPEAR storage ring. This form of X-ray light is known as synchrotron radiation. Working in a team led by Keith Hodgson, then assistant professor of chemistry at Stanford University, the scientists spent hours reaching through a narrow slit in the hutch to tweak the alignment of their apparatus, then closed and locked the hutch and let the X-rays in. 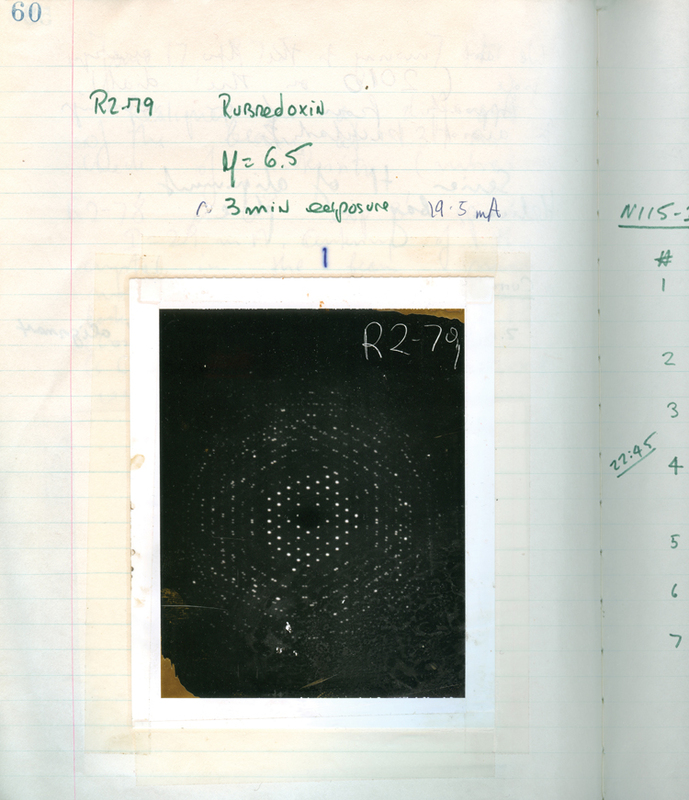 The X-rays scattered off a single crystal of a protein called rubredoxin and left this pattern on high-resolution X-ray film. We were very happy, recalls James Phillips of Iowa State University, then a 23-year-old Stanford graduate student. The news quickly spread among the hutches, and a senior scientist uncorked a bottle of champagne. The team’s published report was the first to describe the successful use of synchrotron radiation for protein crystallography. Those first experiments, along with others in Germany and the Soviet Union, set off a revolution in structural biology.